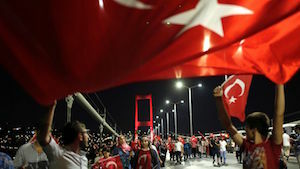 SACRAMENTO, Calif. (KCRA) —As an attempted military coup played out Friday a world away in Turkey, Turkish-Americans in the Sacramento area worried about their loved ones in the volatile country. During the violent and chaotic night, at least 60 people were killed and 1,000 people were wounded. A total of 1,563 military officers were detained across Turkey after some military units failed to take over the government, a source with President Recep Erdogan’s office told CNN. Several families in Northern California were split up during the unrest because family members traveled to Turkey on vacation. Ertugrul Hazar is in a similar situation. He was in Rocklin watching the news and running his Turkish restaurant Anatolian Table, while his wife and three daughters hunkered down during their stay in Turkey. When he first heard about the attempted coup, he called his wife -- who hadn’t yet learned the news. “Everybody is kind of stuck into the houses, into the hotels, into their own places,” Hazar said. “Most of the people on the street now, either they’re against the coup or a supporter of Erdugan.” He is worried that his family’s plans to return home at the end of the month could be disrupted. “To be honest, she can maybe come early or maybe she come late,” Hazar said. At least he’s been able to make contact. Dila Keller, a Turkish-American woman living in Sacramento, is still trying to get in touch with relatives in both Istanbul and Ankara. “I’ve called. The lines are disconnected, they’re saying we cannot call into this country at this time,” Keller said. The Turkish-Americans had mixed feelings about what is best for Turkey. During the conflict, some supported the coup while others sided with President Recep Erdogan.